So you think you know what size a tube is. from fingernail size to building size. No fear - he won't eat Tokyo. Send more of these! They're fun! 7077 #1 John Kaesehagen Here's a real curiosity - a teeeeeny weeeeeny RF tube once used in the PA of the Pioneer spacecraft, because it was actually smaller and better than transistors of the time. 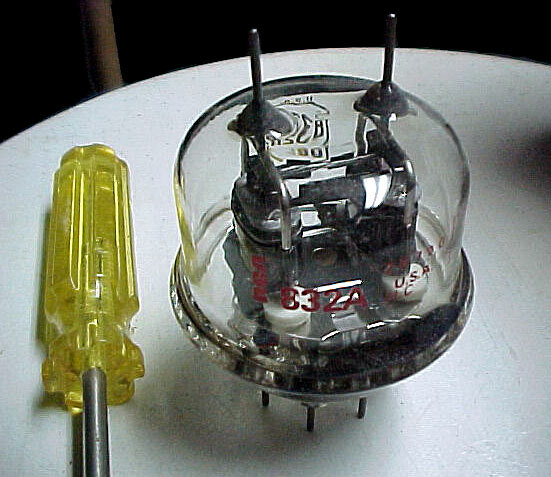 That's a 1N23A microwave crystal diode to the liddle valve's right, and it's bigger! 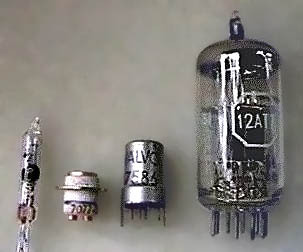 Four Very Little Valves John Kaesehagen Left to right: a submini battery tube, John's itty bitty 7077, a Nuvistor, and a huge, hulking 12AT7 "miniature" tube. 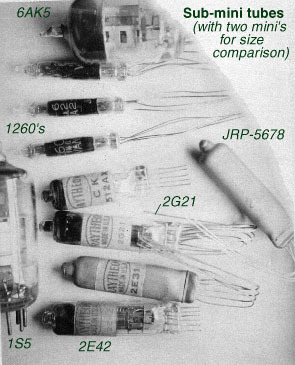 Nuvistor 1964 ARRL Handbook Grungy scan, but showing how the Nuvistor, a hot little tube of the 60s, miniaturized radio converters and first RF stages, until finally replaced by FETs. 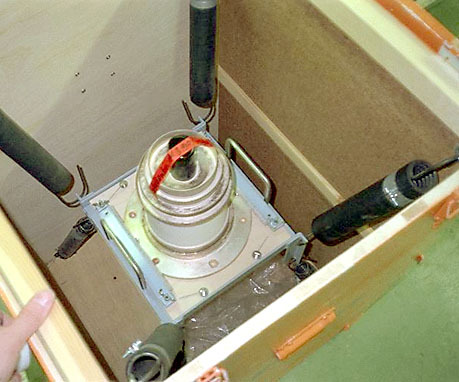 Check the SO-239 coax antenna connector above. It's bigger. 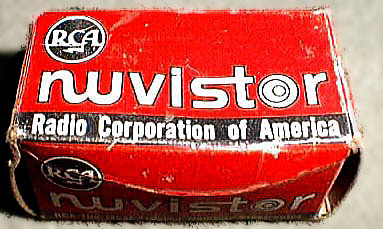 There are still a few Nuvistors in use today. Nuvistor Box Unknown Closeup of the cute little box. I DO love 60s commercial design SO. Raytheon 5886 Brian M. Phelps Submini JAN CK-5886, from a radiological survey meter (nuclear fallout detector) once bought by Civil Defense and nuke plants. 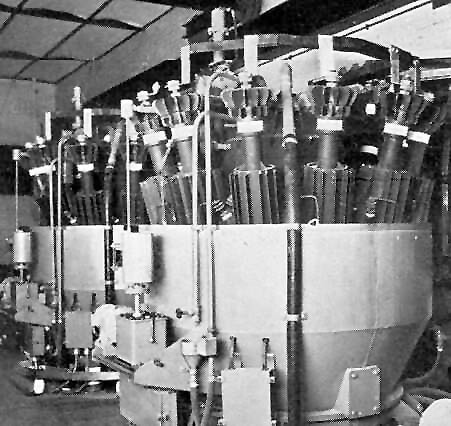 The tubes that tested under one FEMTOampere for leakage were connected as triodes in ultra-high impedance ion chamber amps. That's an enormous US 10-cent coin next to this little guy. 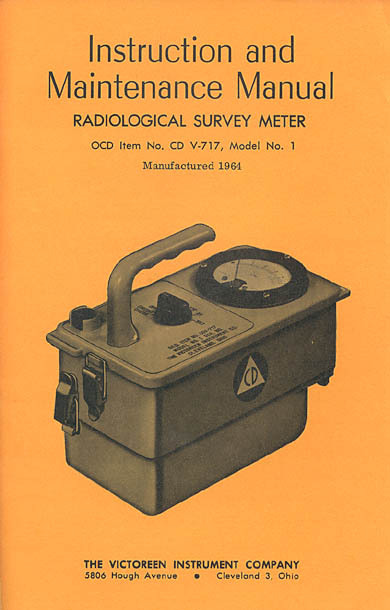 Victoreen Manual Cover Personal collection The ominous cover of the manual for Victoreen's version of this radiological meter, printed in 1964. 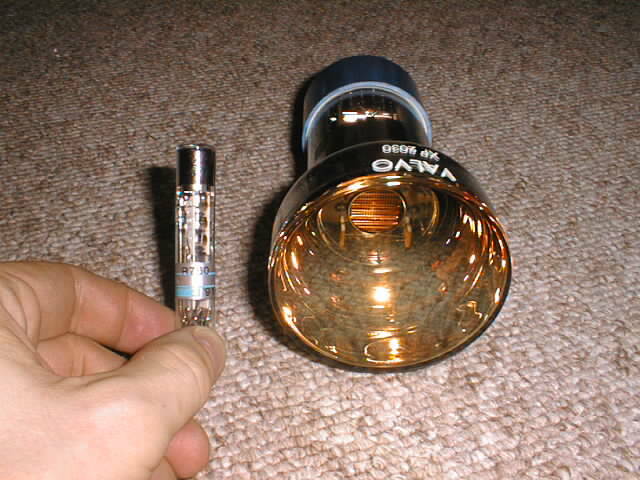 Sub-mini tubes Robert Casey (WA2ISE) Neon lamp-sized tubes once used in battery portable radios and hearing aids. 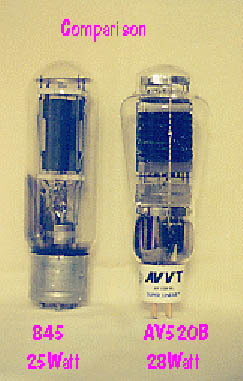 Two tubes of standard "miniature" size are top and bottom for comparison. 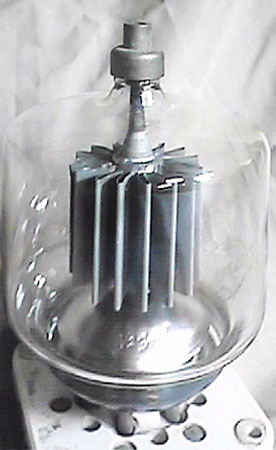 David & Goliath #1 Jorgen Lund-Nielsen "A VALVO EA52 RF-Rectifier and a Westinghouse JAN 5973 (Very) High Voltage Rectifier." 7F8 My Spare Parts Box I stuck this compact "loctal" tube in the flatbed scanner and got a pretty decent image. 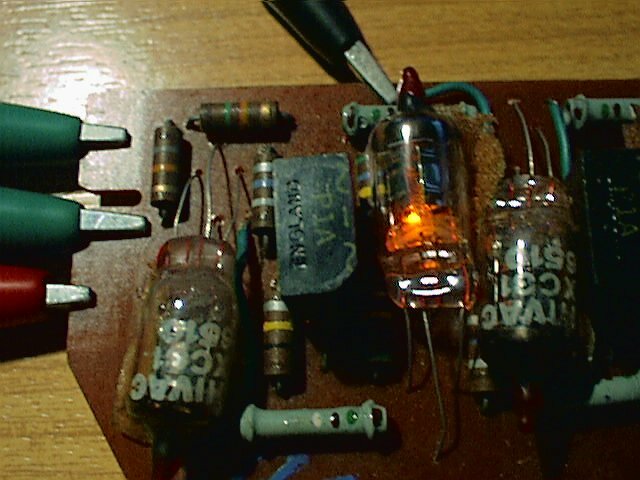 It's the converter (1st RF/oscillator) in my ancient Hallicrafters SX-62A. 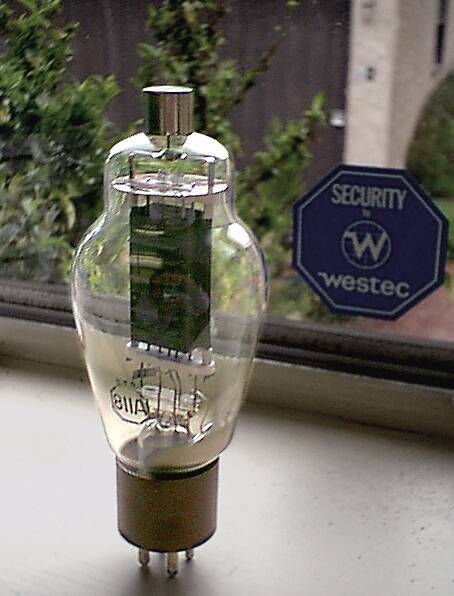 Old WE205 Unknown Neat old Western Electric triode. Note how the plate really is one. 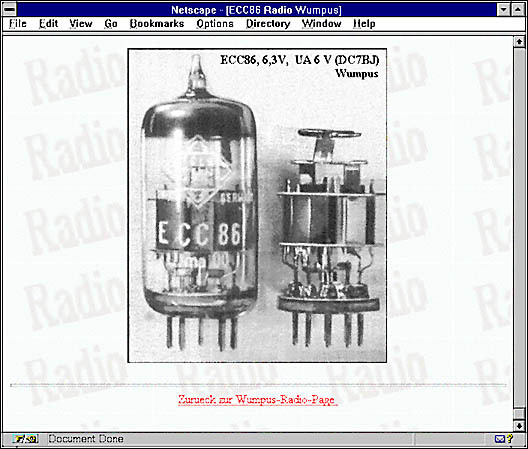 ECC86 Radio Wumpus Small tube, with and without the miniature envelope. 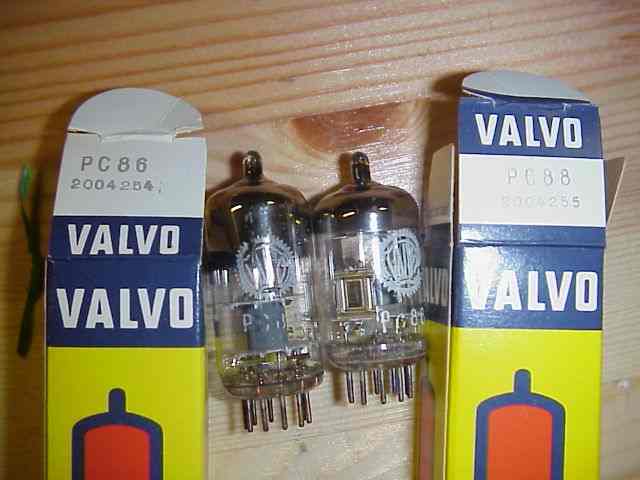 PC 86 & 88 Gereon Kalkuhl Two lil' valvo receiving tubes, with boxes. 5814A Gereon Kalkuhl Another small receiving tube, this time a military version of the ECC82/ 12AU7 made by Philips. Miniature tube adjustment Kurt Brandstetter (Austria) 1951 photo of a manufacturing step for a miniature receiving tube. Audio unit Gereon Kalkuhl This is either an old microphone or an equally old light valve. 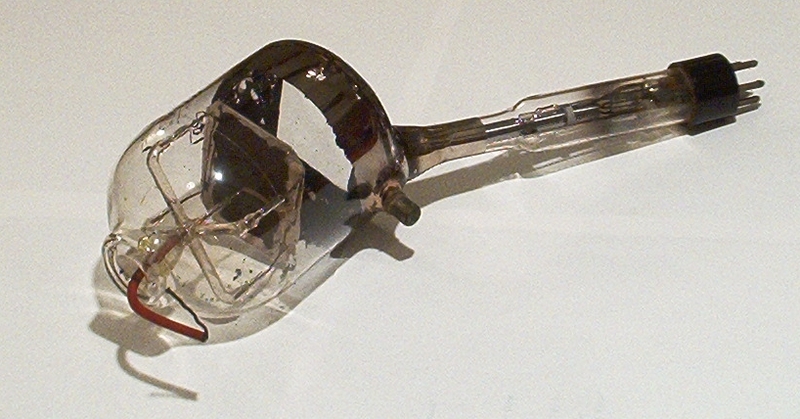 Note the active circuit in the base, complete with mini tube. 3CX300A1 Gereon Kalkuhl Just about the teeniest little old ceramic external-anode transmitting tube you'll ever see. Your typical heat-sink plate connector would be darn near as big as the tube. 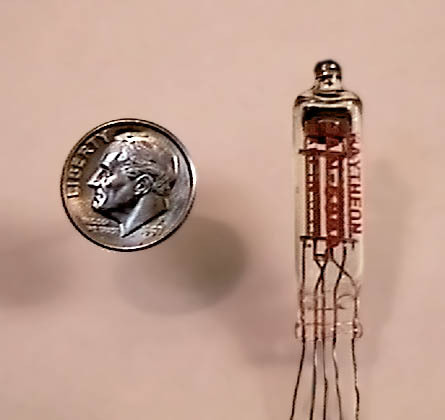 Very small photomultiplier Jorgen Lund-Nielsen "From Hamamatsu, Type R760 and a medium sized Photomultiplier from VALVO, Type XP 2030 If i could find it (no joke, i missed it since about 10 Years...) i have a smaller photomultiplier tube than this, about 3/4 in length and same in diameter." 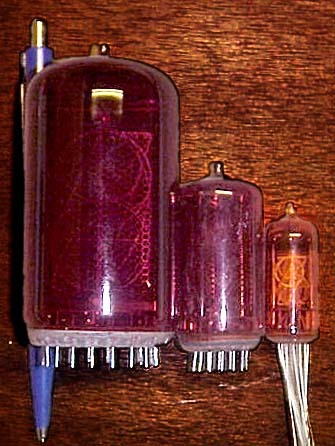 Big photoresistor Jorgen Lund-Nielsen "A giant LDR (Light Dependent Resistor) Philips ORP30"
Small Display Tube Kainz Simon Before LED and LCD displays, tubes displayed glowing numbers by energizing the appropriate segments. 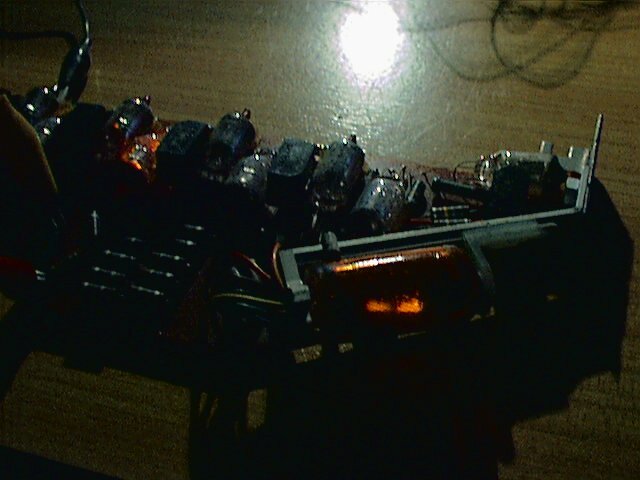 Small ones had spaghetti-like leads which were soldered into the circuit, as we see here. 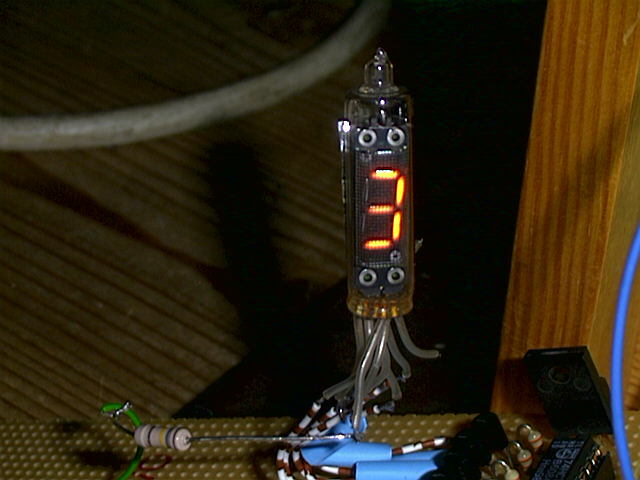 Four Nixie tubes Brian M. Phelps Miniature "Nixie" tubes were used to display numbers, first with 10 or 11 glowing filaments (cathodes) and a common anode, then, as in this example from a digital clock, with segmented displays. 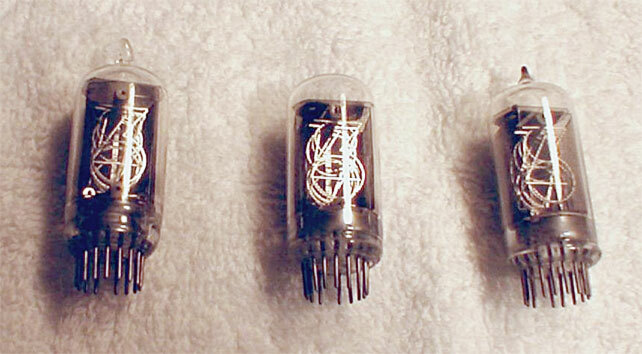 Three Nixie tubes Bryan Bell 3 more minis, nestled all snug in the rug. Good angle to see the different filaments, including decimal point. 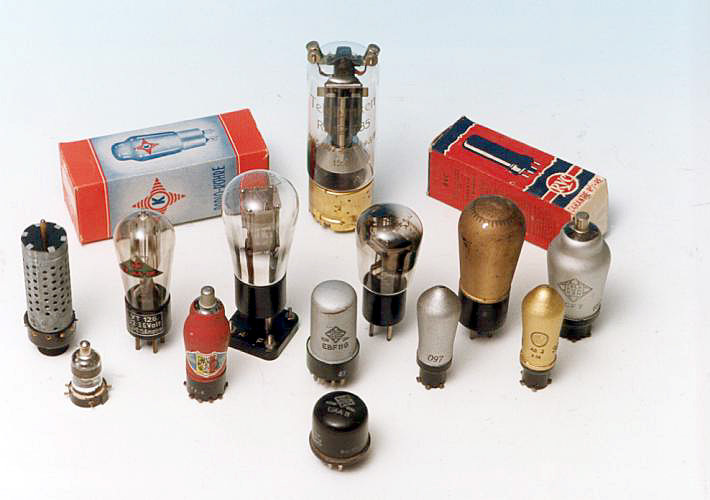 The tubes are marked "NL-5440-a, National Electronics, Geneva, IL, Made In USA." 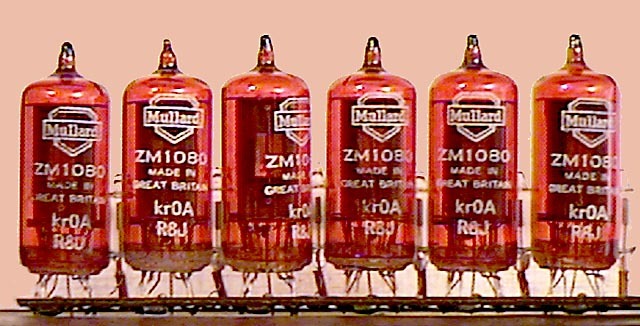 Six Nixie tubes Brian M. Phelps Cool-looking Mullard Nixies with a red coating for readability. 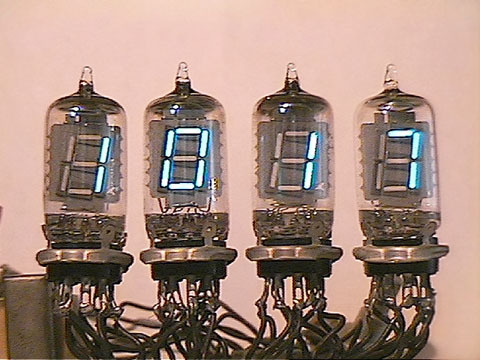 Originally a bank of seven tubes, half of a 14-digit numerical display. 1965 Counter & Display Peter H. Wendt This bizarre-looking card is most likely from a vacuum tube calculator. Picture a big hand calculator, then scale it up maybe 8 times, to the approximate size (and shape) of a small audio mixing board! The circuit card appears British, made by the Bell Punch Board Company, and it was secured vertically beneath an inclined panel. The display used several of these, mounted side by side like the adapter boards in a PC. 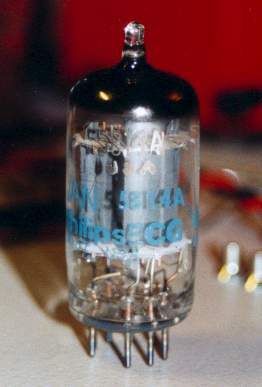 The tube here is a Hivac XN3 "Numicator" Nixie tube driven by a decimal counter based on 10 Hivac XC31 relay tubes. Counter Board Detail #1 Peter H. Wendt This digital photo under dim light shows one of the relay tubes energized. 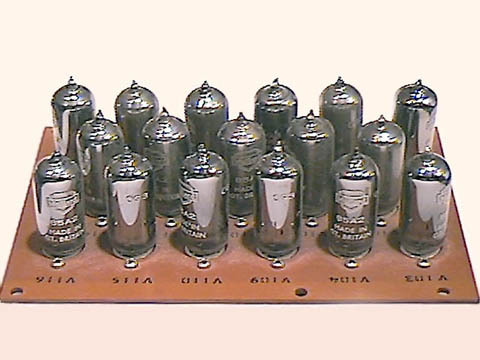 Each tube was coupled to the next, making something like a decimal shift register. Counter Board Detail #2 Peter H. Wendt Here's another view, where the 7 on the Nixie is dimly lit, and the appropriate relay is energized. 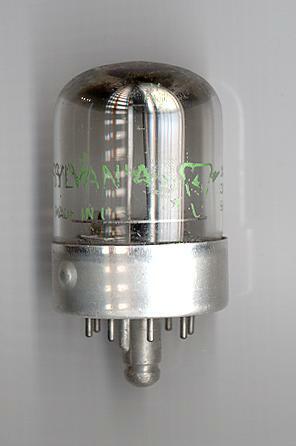 The tube to the relay's immediate left is glowing dimly from an auxiliary ignition electrode. Peter estimates that this circuit operates at about 600 volts DC. E1T Decimal Counter Tube Peter H. Wendt Here's a different type of readout tube, where a rotating light indicated the appropriate digit. 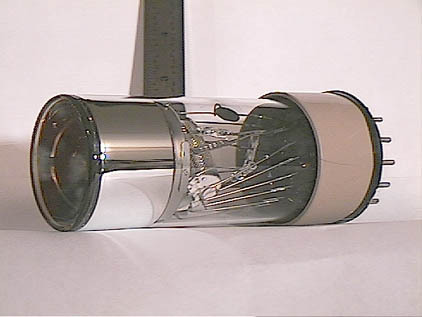 The tube was mounted with the top facing straight out, like a "magic eye." The Nixie Family Gereon Kalkuhl Papa Nixie, Mama Nixie, and little baby Nixie with its wire leads. There's a pen next to Papa for size comparison, so as you can see Dad's a big guy! HUGE Nixie Tubes Jorgen Lund-Nielsen, via Mike Harrison, referred by Alan Franzman (appreciated by Mister Valve) You thought all Nixie tubes were mini's. Of course you did. Fess up. Well, here we see three Nixies. Two are from former East Germany in the 70s. The small one (showing number 6) is about 1.45 in/ 35mm high, a mini for sure. 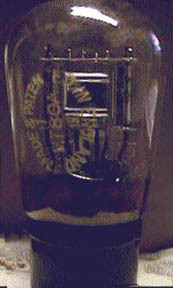 Now, however, peep at the medium size tube (4), which is about 2.25 in. Finally, gasp at the Nixzilla (2), a beer bottle 8.25 inches tall. This one was made by Okaya Electric Industries Corporation in Japan. Those are some summbitch wire filaments! I keep thinking these big mutthas would make a killer clock. 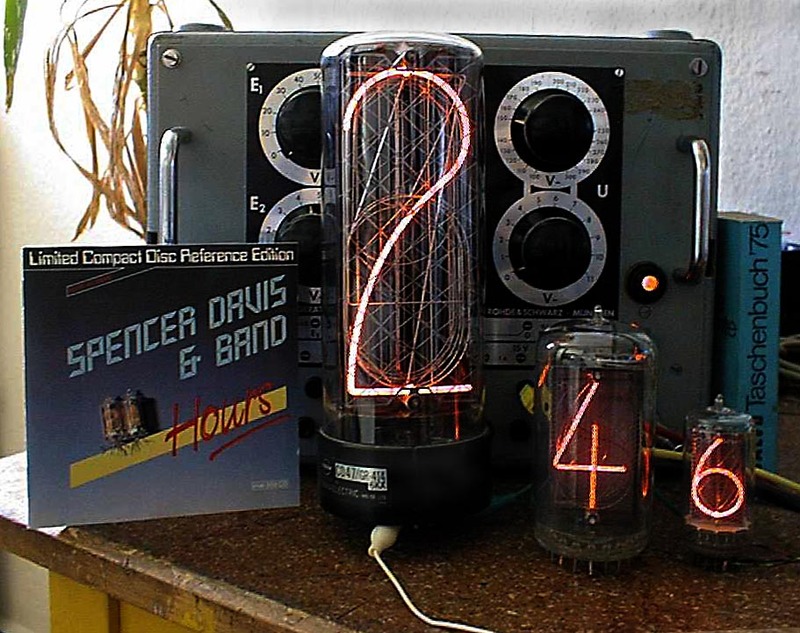 Apparently, the photographer might have been thinking similar The CD booklet he included for size comparison is for a 1984 Spencer Davis thing called 24 Hours, with mini-size Nixie tubes on the cover. Yes, that Spencer Davis. His guitar is as nasty as ever. 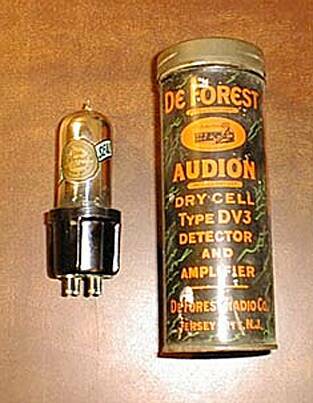 DeForest DV3 Unknown Yes, this is a DeForest Audion. Note the really cool round container - a tube for a tube? P2000 Gereon Kalkuhl Not sure what this is. Check the rather bizarre base. European tube Gereon Kalkuhl Interesting design, especially the base. Valvo? 1912 Lieben Triode Gereon Kalkuhl Very early German triode; a real collector's item. Thanks to Joachim Goerth for identifying this guy. David & Goliath #2 Jorgen Lund-Nielsen "Metal/Ceramic transmitting tubes, a 8755 and a 4CX5000"
Definitely a little 'un lying atop a big 'un. 2 X-ray Tubes Jorgen Lund-Nielsen "A older X-Ray Tube probably >50 Years old, Type 21091 Nr.441389 from C.H.F.Mueller (Roentgenmueller, Hamburg, Germany, now Philips) and a small X-Ray Tube for Dentist's work (Philips, Type unknown)"
832A Unknown This nice clear shot shows the intricate construction inside this weirdly shaped little tube. 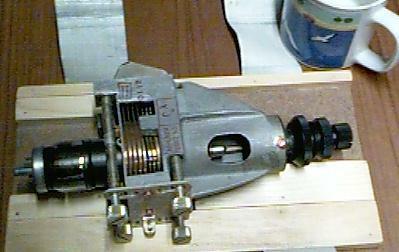 The screwdriver is for size comparison. 832A in space Personal Collection Everyone thinks this tube looks like a space ship, so I scanned it on its way to the moon. 832A base Personal Collection Here's the base of this odd little guy right before liftoff. 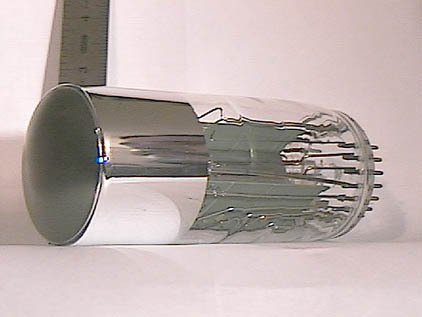 Small photomultiplier Brian M. Phelps Smaller version of the Hamamatsu photomultiplier tubes used in high end scanners, etc..
Hamamatsu 1P21 Photomultiplier Brian M. Phelps Brian says, "A very sensitive photon detector that uses a Photo-emissive cathode in place of a thermionic one. A number of other electrodes (dynodes), each in succession, multiplies the number of electrons in the beam as it progresses toward the anode. 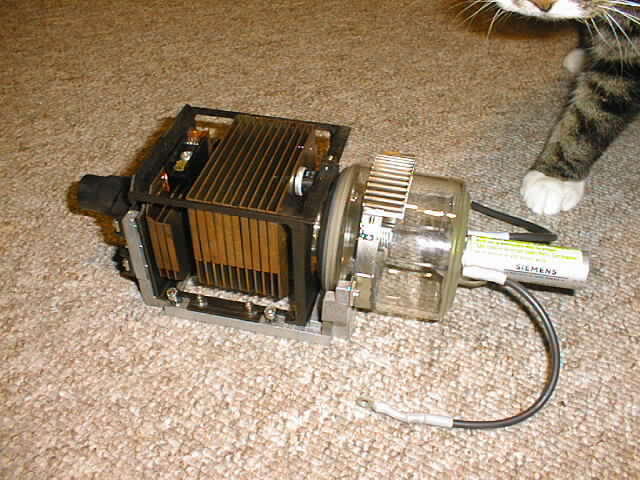 Anode current, thus greatly amplified, indicates the average number of photons impinging upon the photo-cathode. Nifty." G-42 #1 John Kaesehagen Unidentified, old, British triode marked G-42, GPO, and 80A, doesn't look like a rectifier. 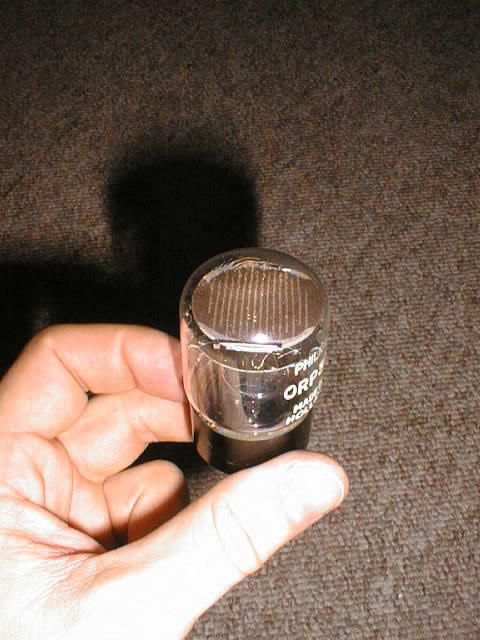 UV-210B Dave Pearrell Really neat old 7.5V triode, made by GE for US Navy, same as type "10." Taylor T55 Brian Carling Same nice old bottle as shown in box section. Silvertone 227 Unknown Very nice old collector's tube; looks like 1920s/ early 30s. Valvo 455 Gereon Kalkuhl Another old tube, in one of those cool Valvo boxes. 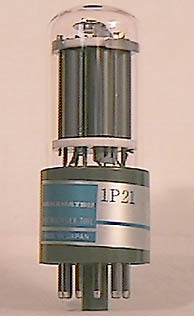 Telefunken 1224 Gereon Kalkuhl One of these neat European tubes with the opaque envelope. Foot X-Ray Tube D. Bromilo Ominous valve used in the Pedoscope, a fearsome British machine once used in shoe stores to x-ray customers' feet! Ouch! European Valve Collection Gereon Kalkuhl This amazing picture shows many unique types, along with two real good boxes. 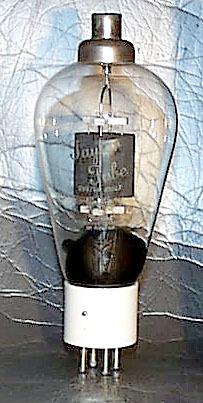 High-voltage triode Jorgen Lund-Nielsen "By Thomson Electronique (France) Type TH5186 (for abt. 75kV Ua)"
Specifications on the cat are N/A. 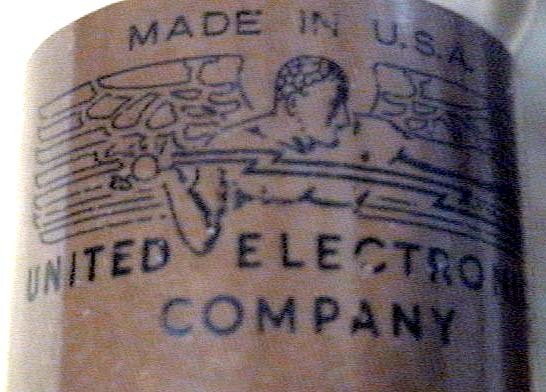 UEC 3B24 John Kaesehagen Rectifier bottle, with a very nice United Electronics Co. logo base. Base detail of 3B24 John Kaesehagen Closeup of the amazing logo on the base, sort of a winged Zeus hurling thunderbolts. I love radio SO. 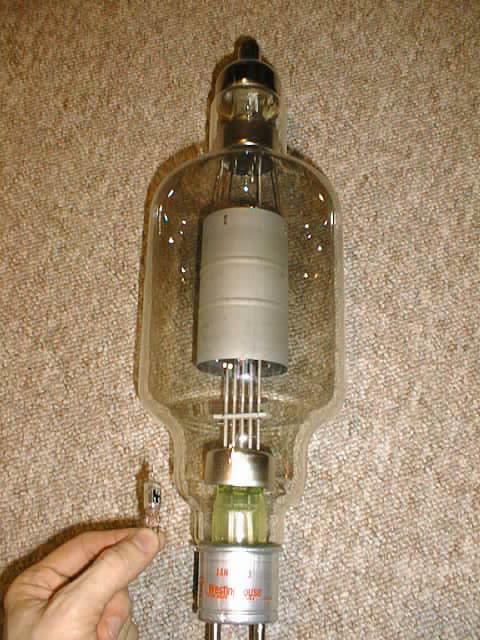 RCA 811A Personal Collection The classic power tube used in the 30L-1 and other such kW ham linears. This one appears to be standing guard. 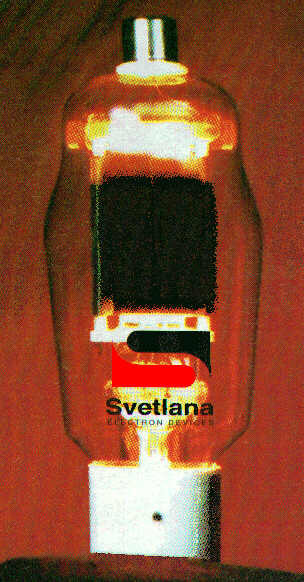 Russian 811A Svetlana ad in QST Imported version of the popular RF amplifier triode. 845 and AV520 Unknown Old 845 and its more modern replacement, the AV520. 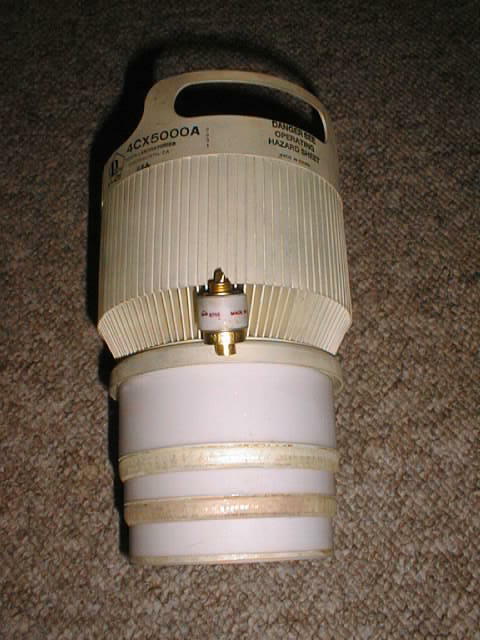 JAN-128A Brian Carling Joint Army/Navy version of a transmitting tube. 1932 RCA Iconoscope NEW Rob Flory Rob writes: "This is an experimental iconoscope (TV camera tube) made by my grandfather at RCA in 1932. The visual image enters through the window on the flat side of the bulbous part." 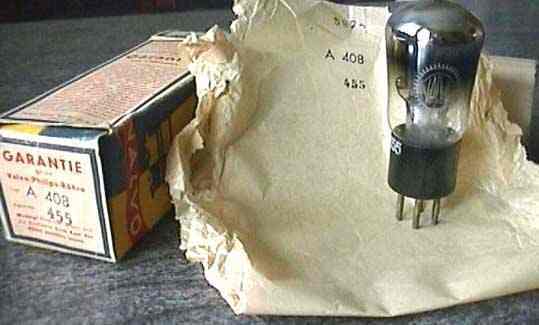 Hugh writes: "This is a VERY rare tube! Download this photo NOW!" 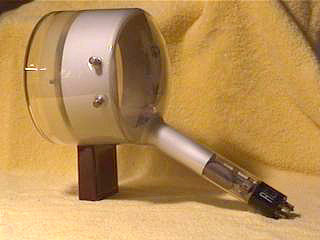 RCA Broadcast Iconoscope NEW Peter J. Stonard Developed commercial version of this video camera tube, from the 1940s. 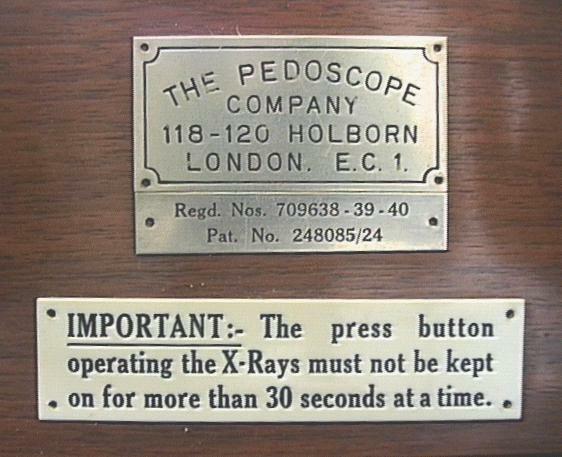 Peter writes: "The Iconoscope was the first practical camera tube (1939). 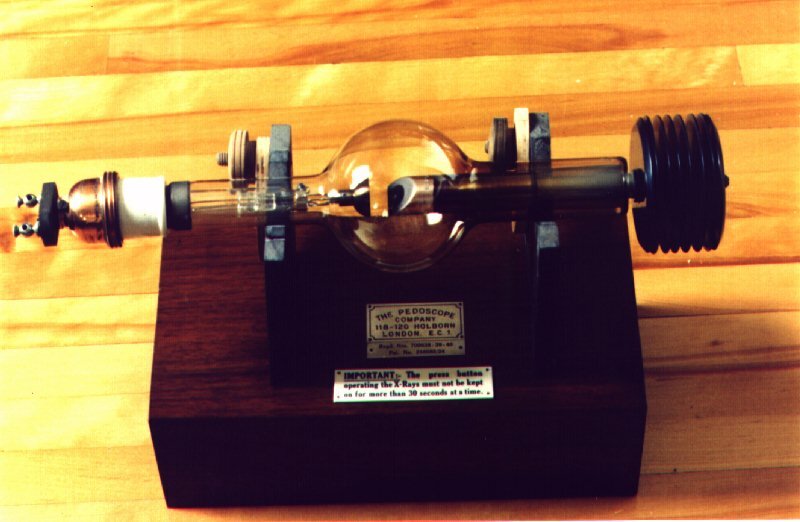 Farnsworth's Image Dissector tube pre-dates it. 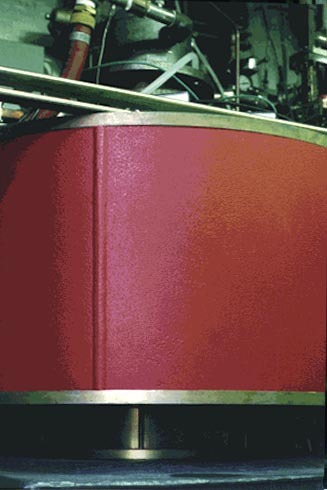 Note the scanning electron gun is on the same side as the image from the lens, but offset to clear the optical path. 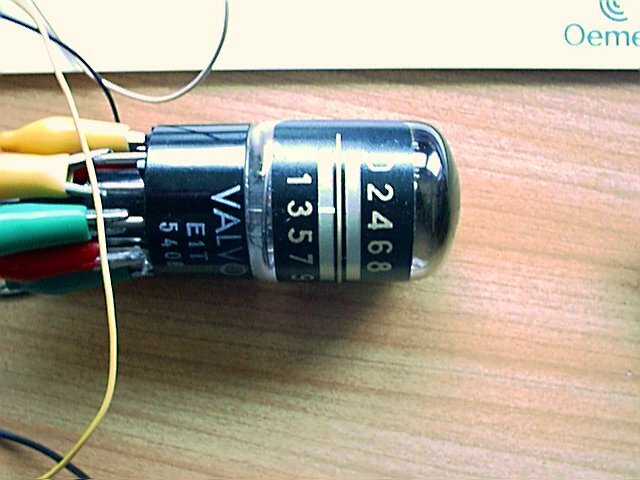 There were smaller ones made during WW-II (4.5 inch RCA 1946) and a 6 inch that was used until the late 1950s in film scanners (RCA 1850A)." 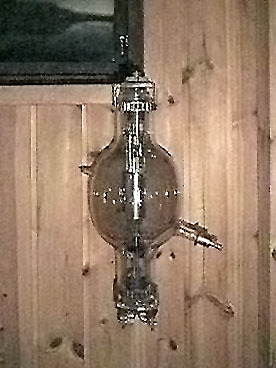 Another Iconoscope NEW Peter J. Stonard Big video tube. Iconoscope camera chains, with the head and various control boxes, were not for tiny studios! 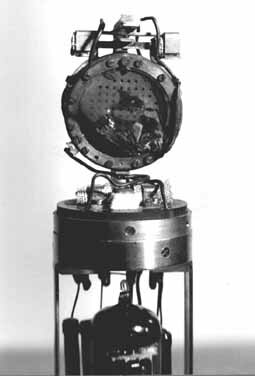 RCA 5820A 3" Image Orthicon NEW Peter J. Stonard "In the late 1940s the Image Orthicon was developed. 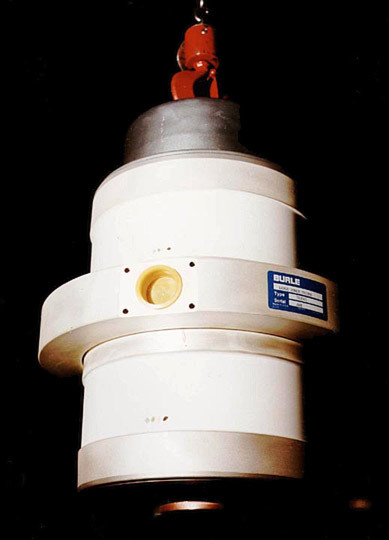 It applied the scanning electron gun on axis with the optical image, and used a photo multiplier at the socket end to amplify the latent (electron) image formed on a glass disc in the neck area." 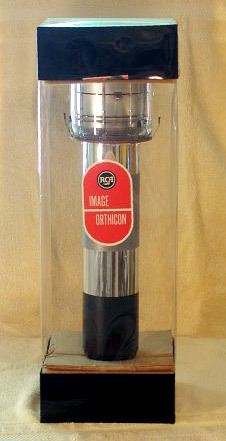 RCA 7295 4.5" Image Orthicon NEW Peter J. Stonard "In the late 1950s a larger IO tube (RCA7295 4.5 inch IO tube) was developed to improve image resolution. 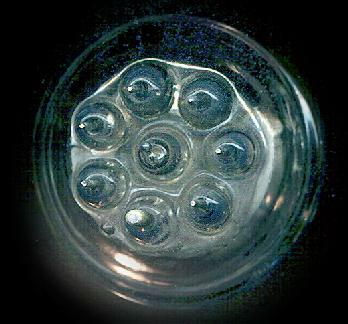 Note this tube used the same optic image (same lens, etc), but magnified the latent (electron) image on the internal glass disc. Larger electron image means better resolution. The other tube internal structures are the same, just bigger. A reversal of most electronics development, where smaller versions follow earlier models. " RCA 7295 in Box NEW Peter J. Stonard And a nice box it is! Would look great next to a Barbie doll. RCA 7295 & 5820A NEW Peter J. Stonard 3" and 4.5" Image Orthicons together for size comparison. 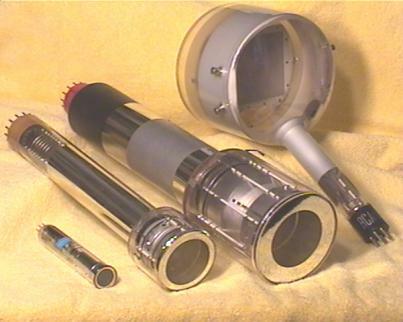 The Camera Tube Family NEW Peter J. Stonard 3" and 4.5" Image Orthicons pose with an Iconoscope and a smaller tube (a vidicon? ), as if on vacation. I hope the little tube didn't get too bored on long car rides. BIG Vidicons NEW Peter J. Stonard Like everyone else, I shot TV with various color/monochrome arrays of 18mm vidicons, plumbicons, saticons, etc., before they were all replaced by CCDs. Camera calculations were vastly simplified for us film types because the small tubes had about the same aperture size as 16mm film. Therefore, it's interesting to see these bigger guys. 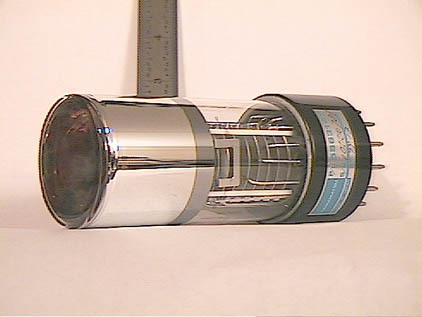 Peter writes: "Before CCD imagers, TV cameras used special tubes to convert images to video signals. 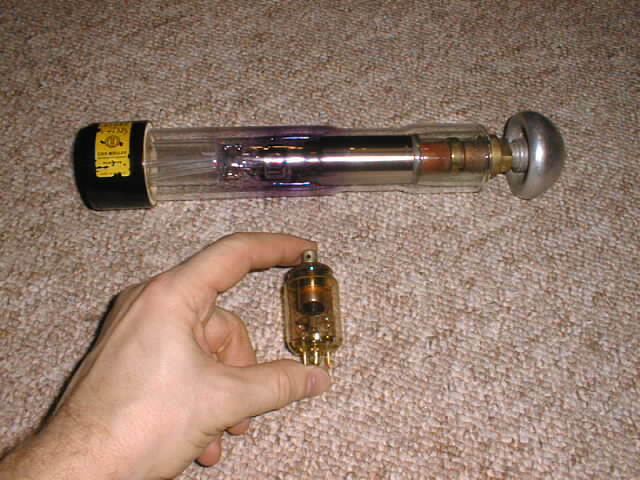 The last tube design (1980s) was 18mm diameter, shown here next to it's 25mm diameter (1970s) predecessor and a very large 30mm tube of the 1960s, when RCA (and the USA) thought 'bigger was better'." 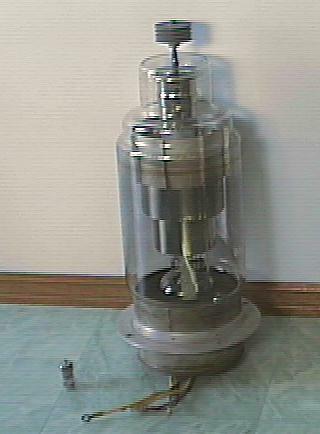 Klystron John Kaesehagen Microwave transmitting tube and interesting cavity assembly. Laser Jorgen Lund-Nielsen "A 50mW Output Power Blue (Argon?) Laser with about 700Watts DC Input Power! What a horrible efficiency...! Type Siemens LGR7801M"
Note the considerably more efficient cat examining the equipment. 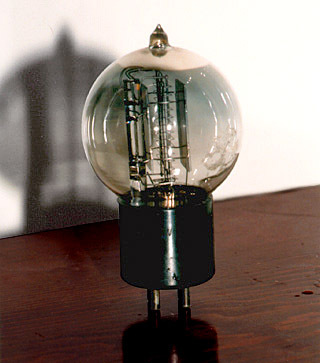 Eimac 4-1000 Unknown The 4-1000 got into a lot of broadcast IPA stages, and when it was pulled after some number of hours, hams could still de-rate the used ones for a single-tube kilowatt, or perhaps even a wee bit more. It's still a good ol' tube. Ceramic PA tube Unknown A modern, high-power, and very expensive, transmitting tube arrives in its spring-damped shipping box. Old transmitting bottle Unknown One of those big, bulbous, glass tubes of the 1920s changeover from spark and mechanical alternators. Nice antique, wall mounted! 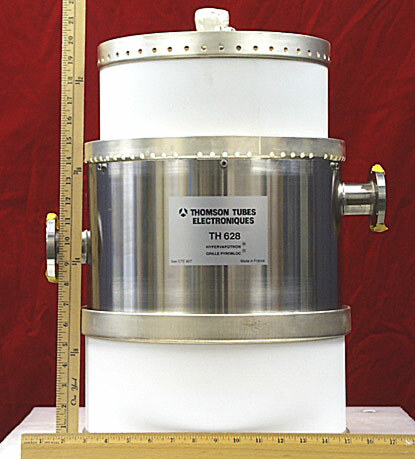 Large thyratron D. Bromilo HUGE microwave tube from a radar station, dwarfing a miniature receiving type. 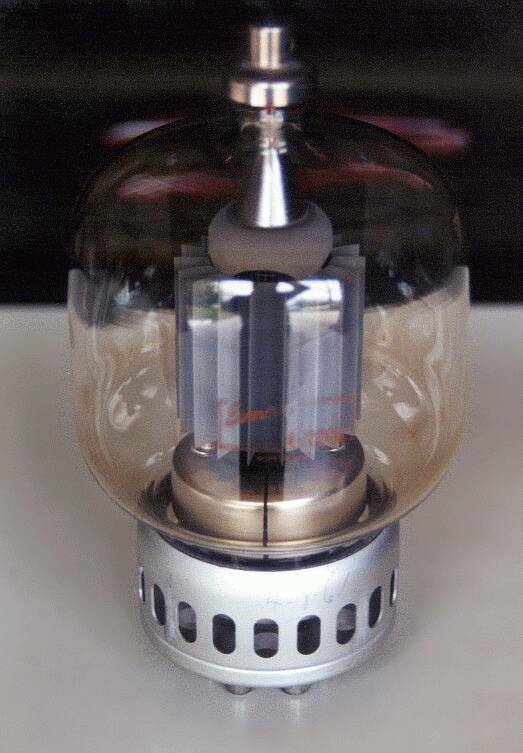 Burle/RCA 7835 Super-Power Triode NEW John Lyles Another big, double-ended tube, hanging from a crane. 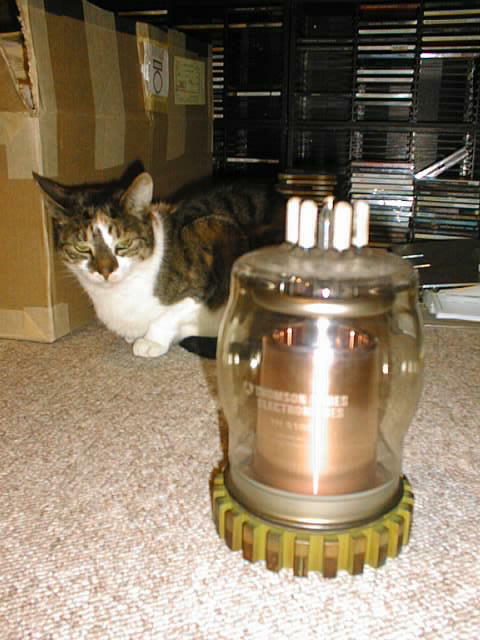 This one is a triode, used to produce 3 to 4 MW of peak power at 200 MHz for linear proton accelerators. 4000-pound Klystron Stanford Linear Accelerator Center This picture shows only a small section of a 5-cavity klystron the approximate size and weight of a large car. 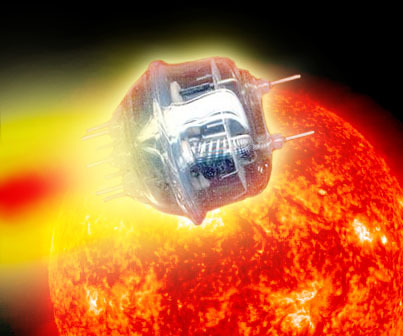 It achieves pulsed power in the tens of megawatts with only a couple of kW drive. 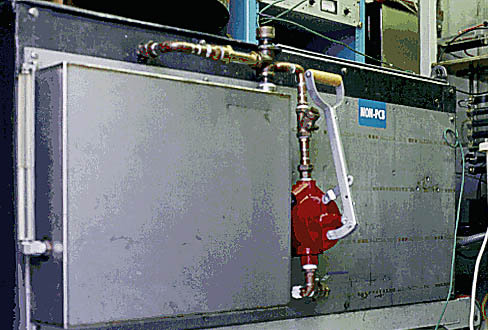 Cooling fittings are at the top. Cooling tank for above Stanford Linear Accelerator Center The tube and its huge power transformer are lowered into this tank of expensive, non-PCB, cooling oil for operation, so that the high voltage does not blow holes in them. Giant arc rectifiers Unknown Building-sized rectifier banks from an old subway power station.